First this breaking story: Yes! A breaking opera story! Who knew? And you read it here first! Jacoba Barber-Rozema, a very young Toronto opera singer, whom I interviewed for this post, and hoped to be able to follow in her future performances, has just won the role of The Shepherd Boy, in Tosca, to be performed by the Canadian Opera Company early in 2012! This is so exciting! Can't wait to see her. Or should I say hear her! Keep reading this post to find my interview with her after her first outing on the COC stage this past spring. My plan has finally paid off! Choosing artful, beautiful opera performances to share with my kids, in order to let them be open to opera as a source of pleasure in life, has worked! One of my kids has most willingly gone to the opera the last few times, but this summer my kid generated the idea of selecting something to see at the Rossini Opera Festival, which takes place in the town where we vacation. But a funny thing happened on the way to the forum, literally. We chose Mosè in Egitto, for the story, showing at the decommissioned sports arena. The day after we bought tickets, it was revealed in the local paper that the young(ish) socialist, English, stage director, Graham Vick, had decided to use the opera as a metaphor for the displaced people and freedom fighters of our day, complete with land mines, and machine guns and burqas. Many people found the idea distasteful, we thought it might be frightening, and we heard later that it was not well-enjoyed by the audience, usually composed of long-time festival fans. Luckily we were allowed to change our tickets for something else. We had heard that the scenography of Adelaide di Borgogna, featured video, while the costumes and props were in period, so we thought it would be the right choice to engage a kid, and it was. Adelaide, an opera based on a true story about a strong and influential woman of 1000 years ago (the wife of Otto I, the first Holy Roman Emperor), seen from an old-fashioned box, in a theatre built during his lifetime in Rossini's home town, was a smash hit, at least in our family! 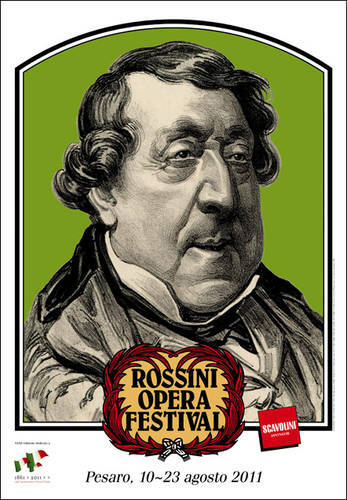 I always love the ROF for making it possible to see the lesser-known, if not unknown, Rossini works. The singers are often specialized in this beautiful bel canto repertoire and I have to say most of the performances were really thrilling. 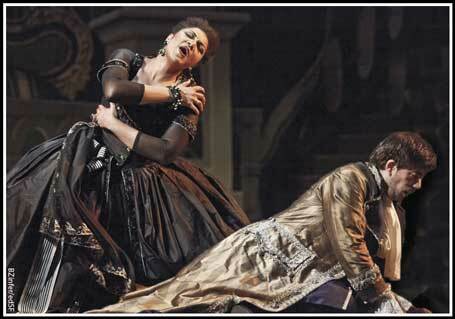 Especially fabulous was Daniela Barcellona as Ottone (Italian for Otto). She is beloved for pants roles in Rossini operas at the festival, and for good reason. And in this case, I have to leave the music comments at that, because it was director Pier'Alli's multiple video screen backdrop that made the whole thing notable. It was pretty fun, if not exactly perfect. For much of the opera, the look was sort of Battleship Potemkin, maybe kind of an homage to Eisenstein? Strangely, at the end, we got into floating umbrellas alla Magritte and a royal coach, all early 20th century - rather awfully out of period - but as James Ehnes said when I (sort of) interviewed him for another post on this blog, art comes from commitment, and I certainly would rather see a failed reach for the stars than an easy sure thing, so I was good with the attempt. The enthusiasm of my bigger kid left my littler kid saying "Isn't there an opera I can see?" and we had to say "Sorry, that was the last night of the festival! Next time." I think this success was built on our other opera outing of the year, the Canadian Opera Company's Ensemble Family Performance of Mozart's The Magic Flute this past spring. That was a wonderful evening. The tickets were at the right price to allow for a rustling and restless audience filled with children, and even to leave early if need be. Of course, The Magic Flute is not only sensational musically, with quite a few parts familiar to many kids, but also has a brilliant story and the surtitles had everyone laughing at jokes we could not have understood otherwise. 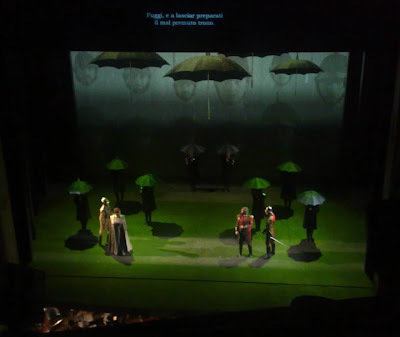 As well, and here is the connection, it also benefited from great scenography and innovative rethinking of the staging, and fabulous costumes. I mean, punk-viking girls with glasses! Does it get any cooler? And the idea of a play being performed at a garden party within the opera, the small stage slowly taking over the larger, was really well executed. In any case, the killer feature of The Magic Flute for us was that a girl from my kids' school had a big role, as the Third Spirit. Her performance was SENSATIONAL and we will be hoping to follow her career as the first members of her fan club. She managed to dig up for me a picture of the spirits crossing the stage, pedaling slowly, but traveling very VERY slowly on their enormous tricycles, while singing ethereally. The effect was amazing, and audience members of all ages loved it. 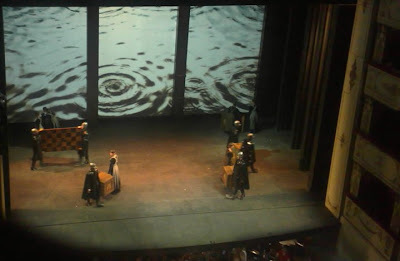 The spirits are really major, spending quite a bit of time onstage through-out the opera, so it really went a long way towards the overall success of the performance that they were so effective and so effectively staged. The kids I was with found it incredible that a schoolmate was such a star. And...it's not every day that you can ask a very young opera singer what they are all about, so I found a mutual friend who helped me ask her some questions, and I got back some very interesting answers. Nervous Marigold: Do you want to be an opera singer, or is this a way of rounding out your experience, or testing opera as a future career? Or other? Jacoba Barber-Rozema: I saw my first and "fell in love" (I guess you could say) with opera when I was 8, and knew I wanted to be an opera singer since I was 10. Being in Flute and seeing more and more of what the professional life is like, makes me want to do it even more. But it's definitely not the easiest career! You said you saw the Ensemble show? Unfortunately, I didn't spend very much time with that cast, which I would have loved to do. It gave me a more realistic look at first cracking into the business and it was a completely different energy - much more excited. I'm fifteen now and my dream still hasn't changed, but who knows what the future holds. NM: Was it weird doing a pants role? Do you sing in your adult voice, or is that still to change? Are you a soprano now, and what will you be in the future if it is different? J B-R: You know, doing a pants role was actually a lot of fun! At the very beginning, at the audition, there was kind of a competition to see who can look the most like a boy, but I'm very good friends with the other girls who were chosen, so that soon faded. The lovely Isabel Bayrakdarian, who sang Pamina, once called us "bearded ladies", which we found very funny. I am a mezzo, but I sang the third spirit in flute. I think my voice is still yet to change, yes, but probably not too drastically from what it is now. NM: What is your favourite opera (and maybe why)? NM: What is your favourite current song? (Do you have Bieber fever, like Emily [our mutual friend - ed.])? OK - this is a bit banal, but it's so fun to know. J B-R: That's too hard! I think I may have Beatles fever, if there is such a thing. I know every song, so that and other sixties music is mainly what I listen to. As for contemporary music, some of my current favourites are Regina Spektor and Ingrid Michaelson. It's been SO strange not rehearsing or hearing music from The Magic Flute, so I've been listening to a lot of that lately. I ate, slept and breathed Flute for almost a year and suddenly it's completely gone. Sometimes I have dreams about it - the pre-show adrenaline, listening to the overture while watching from backstage and waiting for the curtain to come up. I hope my future opera experiences are even half as amazing as The Magic Flute was. What a clever and interesting person, in addition to being a gifted performer! How rare! How inspiring! What a great role model for arty kids! Finally, and related, although not thru the kid connection, this spring I saw my beloved Opera Atelier with no kids, (thank-you, Diana!) as usual doing their utmost to specialize in the obscure, performing La Clemenza di Tito, an opera seria by Mozart. 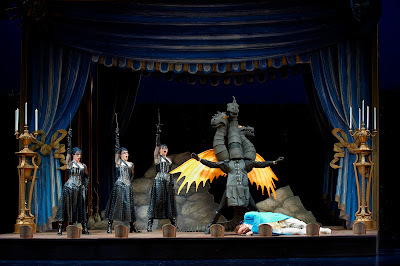 I noticed that I had seen the cast before in Idomeneo in 2008, that is, fabulous soprano Measha Brueggergosman and exotic male soprano Michael Maniaci and the amazing tenor Krešimir Špicer and others. And in fact, at the performance I learned that, very delightfully, OA had promised this cast to bring them back for Tito. Idomeneo is considered Mozart's most successful opera seria (a HIGH BAROQUE form - notice this, James Ehnes - most often used to praise or flatter a monarch or noble). I really loved it when I saw it, and here is my review from that performance. Tito had everything in place - but somehow was less of a thrill, just as historical critical opinion would have it. 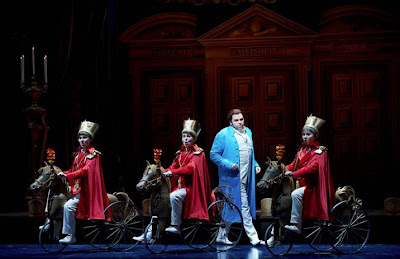 Luckily we were told in artistic director Marshall Pynkoski's usual on-stage opening remarks about the personal commitment of the performers to doing the opera. I think it gave everyone a warm fuzzy open-ness to the production. He explained that that the story was well known to audience's of Mozart's period. The program illustrated the point on the cover, using this quotation from Racine's play Berenice, instead of a picture: Pity my rank. Lord of the world, I guide its destiny. I can make kings and unsceptre them, yet I cannot give my heart to whom I choose. WOW! The opera tells the true story of the Roman emperor Titus. He was renowned for both his love for his Judaean mistress Berenice, whom he sent away, realizing he could never allow himself to marry her, and his clemency toward a couple of traitors, refusing to have them executed, and in fact sharing an inspection with them at the arena. It is marvelous to think of things that were once so well-known and admired, that are now so completely gone from culture. I know, I know, like "opera", right? On the other hand, although the music was lovely, and the performance was fine (despite a funny scene-changing error, requiring a hot two-girl kiss scene to be repeated while they finally made the change), but somehow no thrill. 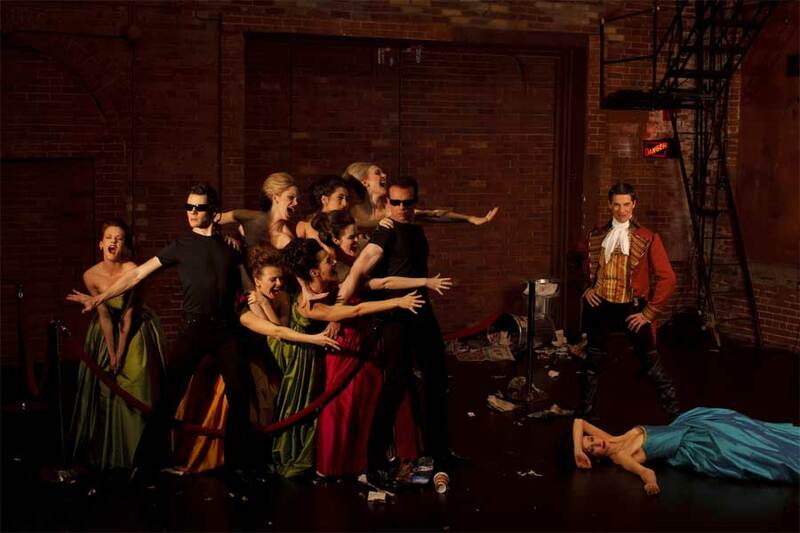 Won't stop me from going to Don Giovanni, which they are remounting this fall. [ed. note: just about now] The 2004 performance of Don Giovanni was my introduction to Opera Atelier, and I have had a crush on the company ever since. To start with, Tito was written by Mozart as a commission for the coronation of Holy Roman Emperor, Leopold II and Mozart wrote it at the same time as he was working on The Magic Flute. Cool. 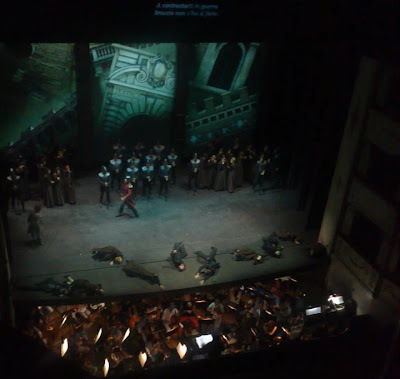 More interestingly still, (to me) is that Adelaide in Borgogna felt like opera seria to me, about pair of monarchs of high honour and personal bravery. When I was looking for a connection, I saw that Rossini was called "the little German" because of his admiration of Mozart. He was born in 1792, a year after Mozart's death, and apparently he attempted to revive the baroque-leaning opera seria style. But for whom? During this period he worked for an Italian princess, for Charles X of France, and for Charles's father- or grandfather-in-law Ferdinand IV of Naples. Although it seems he wrote Adelaide for one of the commercial opera houses of Rome, Charles and the Ferdinands were important Bourbons with the royal family's strength based in Burgundy. I wonder if it was just on his mind, or if it was a hopeful attempt to flatter? I wonder if the truth is out there? Now the marigold is wondering nervously if it is possible not to kill this fragile bud of kid-interest with over-enthusiastic adult encouragement. Perhaps I should start discouraging interest in the opera, to get them really going? Or is that too much of a game? Plus, why are there so many editorial comments in this piece? Who is that nosy editor, anyway?